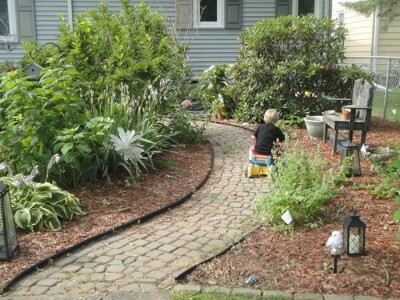 When we first opened as a home daycare, a portion of our backyard was landscaped and easy to maintain. As I have gained knowledge of how important play and being able to enjoy the outdoors was to me as a child, and what I would like to offer other children, ideas began to flow. I remember as a child being able to play hide and seek, make “potions” as we called them, hang bird feeders and of course ride bikes until our parents called us inside. Having a landscaped area allows the children to enjoy the butterflies, ants, worms and the beauty of the outdoors. The landscaped area includes a brick pathway for the children to run and explore the beauty of nature. A seating area was set up for the children to gather and talk about what they see. 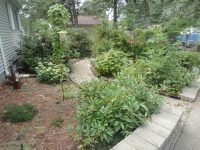 There are a variety of plants including butterfly bushes, hostas, hydrangeas, and peony bushes. As I became more knowledgeable about an outdoor classroom, I decided that was what we needed to include for an additional learning environment. 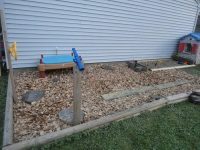 I wanted to include new textures within the space, such as an area with cedar chips with a balance beam and a pea gravel area to scoop and dump and to run cars and trucks and tractors. We included a sand and water table for added sensory experiences. 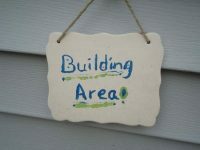 A mounted telescope allows the children to view different areas of the yard and a bird feeder is posted just a few feet away. The yard is a great size for running, jumping, crawling and good old fashion running around. We have a music wall that the children can explore making different sounds and also express themselves either by dance and movement or using instruments. We included a chalkboard wall so children can draw either on sidewalks or on the chalkboard. 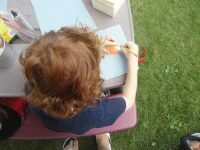 Our picnic table is great for enjoying lunches outside as well as being used for an art area. 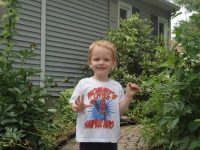 The children are free to find items such as sticks, rocks, and pine cones. We have also included shells in this area along with crayons, marker, and colored pencils and paper so that children can trace or draw whatever they like. Supportive families, who enjoy seeing the transformation and the learning that the children gain by their experiences here, tied with my supportive family, allowed for a smooth transformation of the environment. My father made the mallets used in the music wall and my husband used his own time to help define the areas with timbers. He also installed the telescope and steering wheel for added dramatic play. My daughter and I painted unique signs for the areas and it was wonderful time spent with her outside. I plan to continue to observe the children and increase or change to improve our outdoor learning environment.